This historical photo shows the early stages of construction of the Convention Center MetroLink Station in downtown St. Louis on January 13, 1992. The photo was taken looking west on Washington Avenue. The old St. Louis Centre is on the left and you can also see the old walkway from St. Louis Centre over Washington Avenue that was removed when the mall closed on September 15, 2006. When it opened in 1985, St. Louis Centre was the largest urban mall in the country which included 120 retail stores, 20 restaurants in the food court, and anchored by Famous-Barr and Dillard’s department stores. The brick tunnels were built in 1875 along with the completion of the Eads Bridge. The tunnels were later used as a freight route as passenger trains bypassed the tunnel for Merchants and MacArthur Bridges. Today, those same tunnels are used by MetroLink, connecting Stadium, 8th & Pine, Convention Center and Laclede’s Landing stations. *I think* it is probably the Convention Center Metrolink Station construction site, looking West down Washington Avenue at 6th Street. 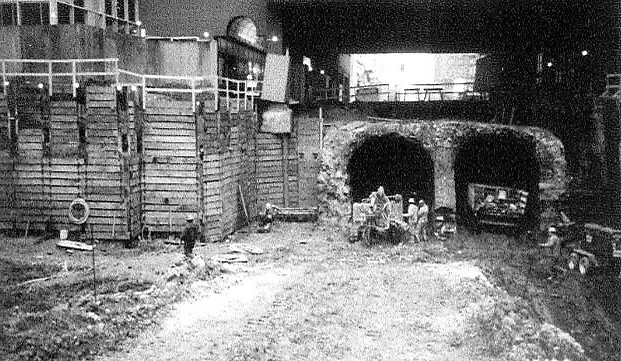 And since it’s mid-excavation I’d put the photo at 1990/91 or so, since the line opened in ’93. Good job John! The photo was taken on January 13, 1992.